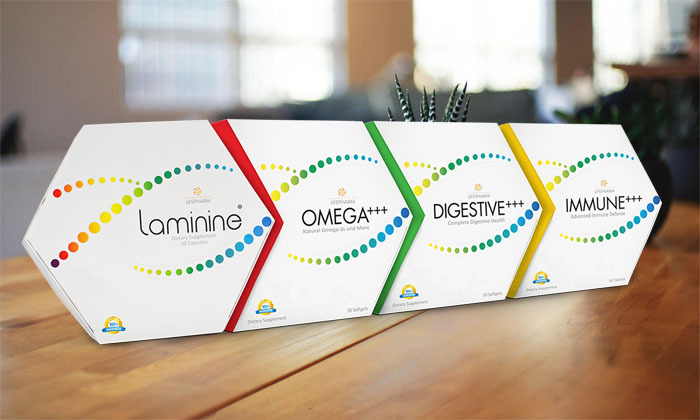 Laminine is 100% natural Food Dietary Supplement that comes from partially incubated egg. It contains OPT9 Blend Ingredient that contains Fertilized Avian Egg Extract (FAEE) that repairs damaged or aging cells. Each capsule also contains 22 amino acids+ and important vitamins and trace minerals. Laminine comes from the word "Laminin" (cell adhesion molecule in the body), and the number Nine, which represents the 9th day when the fertilized egg is best extracted from an avian egg. Laminine boosts physical, emotional, and mental strength. Based on research, it reduces cortisol (stress hormone) and regulate serotonin. It also has studies on blood, sugar, wound repair, and cholesterol. DIGESTIVE+++ is a combination of probiotic and prebiotic. plant enzyme that help breaks down nutrient and aid indigestion and other stomach discomforts. Contains 1.5 Billion CFU of Bacillus Coagulan. IMMUNE+++ contains pure Vitamin C, Camu-Camu, Acerola, Ashwagandha, Sea Buckthorn, and Pomegranate. The blend supports your immune system naturally. It is time released, protecting your for 24 hours. Team Althea takes customer service seriously. We believe that a lasting relationship is important. Our group prides itself of dedicated customer support and product knowledge and expertise. We're think forward and keeps to heart the best practices in the food supplement industry. Geraldine is a world-class athlete. She suffered 'Achilles Heels' during competition training. Laminine helped her recover quickly and she felt stronger each day. She became more focused like never before and also slept better. She is grateful for this unique protein extract. Kevin suffered for a time from stroke, aneurysm, joint pains, and vertigo. Recovery was difficult. Years later, he took Laminine for the first time and immediately, his mood changed. He felt better, more alert, alive, and slept better, helping him towards full recovery. Bonnie's 13 years old daughter has autism. After taking Laminine, she was able to increase her upper body strength that helped her swim at longer distance. Her mom also noticed many good things that happened with her daughter when she took it regularly. Rick suffered concussions playing football. He became depressed. His brain injury was later diagnosed as Chronic Traumatic Encephalopathy. After taking Laminine in less than a week, his mood changed and he began to feel better. His life totally changed, thanks to Laminine. One of the early testimony of Laminine in 2011, Golf's mom was in morphine because of a terrible back pain for more than a year. After 2-weeks of Laminine, his mom regained strength and 3-weeks after, Golf said "my mom was mom again," she is fine! Study, product review, membership & delivery.